– I like race officials and in the races Competitive Cyclist organizes we shower them with baubles and gifts to show our affection. A small request of Race Official Nation to exhibit the best traits of a bike racer: Self-sacrifice & sticktoitiveness. Please oh please squint those eyes so we can wear our race numbers the right way, and stop asking us to re-pin them in non-PRO, sponsor-logo-nullifying ways. – If you already follow Competitive Cyclist on Facebook or Twitter then you already know we consider this Nicolas Roche article in the Irish Independent the single best PRO blog entry from the 2010 Tour de France. A close second is this revealing entry from Omega Pharma’s Charlie Wegelius, written after he dropped out prior to Stage 11. 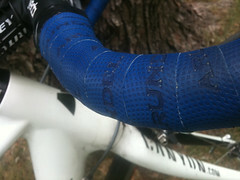 – The discovery of the summer: Arundel Gecko handlebar tape. It’s too damn hot out to ride with gloves on, and is anything worse than July’s perma-sweaty palms? It takes just a few miles for Fizik Microtex tape to end up slick like old-school Benotto cellotape. And ordinarily brainless-&-reliable cork tape (either Cinelli or Deda’s cork-like ‘foam’ tape) has only limited sweat-absorption abilities before getting saturated and turning slithery. Arundel Gecko has the soft cush of cork and it’s textured for extra grippiness, which is maybe why it never gets a slippery sheen. The texturing is just right -- and it’s something I’ve never seen on any other tape. Arundel Gecko tape is Competitive Cyclist approved, especially for summertime, where it crushes all comers like Spartacus in a TT. – Can’t we all just get along? – Paging all ski racers: When you buy your racing license, is it one license for all disciplines, or must you buy one for downhill, one for ski jumping, one for cross-country, etc? The reason I ask is that there’s something very right about the Nordic combined: the need for real verstaility. As road bike racers we need to be multi-disciplined in the sense that we must both climb and crit race. But the truest expression of multi-discipline would be a stage race with 1 stage of road racing and 1 stage of mountain biking. We’ve given 3 beers-into-Friday-afternoon-type of consideration to putting on a race like that, but USA Cycling’s licensing process makes it impossible. Strictly from the standpoint of developing up & coming young bike racers, it’s absurd that we must buy different licenses for road vs. off-road. Racing bikes presents the biggest financial burden this side of drag racing. Why add extra cost where there’s no extra value for the member? We should buy one license -- and it should cover everything – Road, MTB, CX, BMX, Trials, etc. What is the benefit to having it otherwise? Even worse is the conundrum for the promoter: There’s no correlation (except in name) for categorizing riders between road and MTB. If I’m a 2 on the road yet I’m a 4 in MTB by virtue of rarely racing off-road, how would I fit in a road/off-road stage race? If USA Cycling ran the US Ski Federation, the Nordic combined couldn’t exist. – Looks like a lost opportunity for Rapha. Cycling-specific denim at Barneys, brought to my attention via an email titled ‘Blokes on Bikes.’ And, since you asked, the etymological background is here. (2) Related to 1: What’s the driving force behind the putative need for the iBike Dash’s massive screen on your bars? Surely it’s the real-time mapping functionality. What Garm*n (with the 705) and iBike fail to recognize, though, is that 99% of us are riding the same ride routes 99% of the time -- no thanks on the map. For the 1% of the time when we’re riding somewhere strange, units like the 500 capture all of the mapping data and it’s brainless to download it to a PC so we can review the ride afterwards. Nothing is more overrated than real-time mapping, and nothing is more fun on a bike ride than getting lost. (3) The market has shown great skepticism about calculated power measurement vs. direct force power measurement. I know this from conversations with customers. 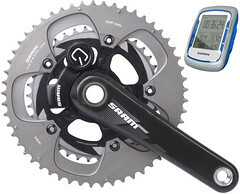 I know this from seeing our lifetime-to-date sales numbers for iBike vs. SRM, Power Tap, and Quarq. By the time a cyclist goes to the trouble and expense of training via power, the idea of skimping on powermeter cost (since low price is the biggest upside of an iBike) is pennywise/pound-foolish. And saving money is the only reason to not use a direct-force powermeter. There’s nothing wrong with not being able to afford one, but until you can, just use a heart rate monitor. (4) Who isn’t shackled to their phone more-or-less 24/7? Who isn’t fighting an accidental iPhone addiction? Between phone, text, RSS, social media and all the other digital heartbeats by which I find myself measuring the state of my business and family life, isn’t one beauty of going for a bike ride the eager unplugging of oneself from one’s device? I’d sooner use a Clean Bottle than ride with the #1 distraction in my life on my bars. – When Laurent Fignon’s autobiography appeared last year in France, most of the attention it received focused on his doping confessions. The book has just been released in an English translation by William Fotheringham as ‘We Were Young and Restless’. The doping confessions are still there. But not only are they pretty tame, they’re the least interesting aspect of the book. Laments about the passing of cycling’s golden age are standard equipment in most retired riders’ memoires. (As a result the sport’s golden age appears to have start at turn of the 20th century and come to its end in the last year or so.) Fignon’s is no exception. But Fignon’s well deserved reputation as one of cycling’s most contrary yet intelligent members makes his criticisms of the sport’s current state worth consideration. As a flip side to all this, Fignon proposes that the peloton revert to its method of sitting-up and riding to the finish at 30 to 35 kilometers an hour when breaks appear successful. Domestiques, he adds, should no longer feel compelled to complete every kilometer of every classic once their job is complete. The Giro organizers seem to have heeded some of Fignon’s advice over the last couple of years and arguably the Tour has toughened itself up. Even the Tour’s peloton has sat up once this year. 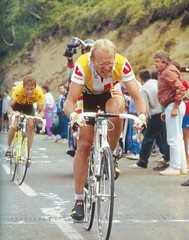 Fignon himself is going through a major challenge. When the French version of the book appeared he revealed that he was being treated for advanced cancer. The situation has not improved. Fignon has had to cut back on his job as France Télévisions’ Tour commentator. He’s now only working the marquee stages. Let’s all hope that situation reverses and Fignon has many more years as cycling’s iconoclast.